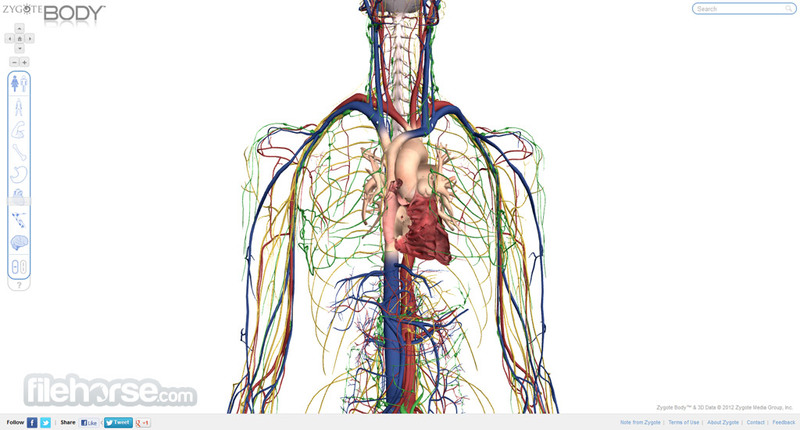 Zygote Body (also known as Google Body Browser) as a Google-made webapp that allows you to discover fascinating knowledge about human body and the our organs work. With easy to use interface and streamlined controls, you can easily navigate inside human body and expand your knowledge about brain, organs, muscles, nerves, circulatory system and other parts of our body. If you don’t want to manually search for the exact organ or part of our body, integrated search engine will do that work for you. Just start typing its name, and Zygote Body will direct you to it. 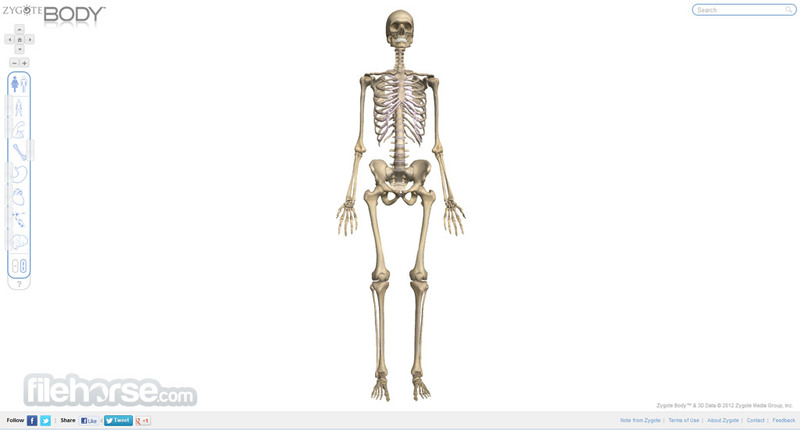 No matter how educated or old you are, Zygote Body is a perfect webapp for those who want to learn more about human body. Explore and discover human body today! 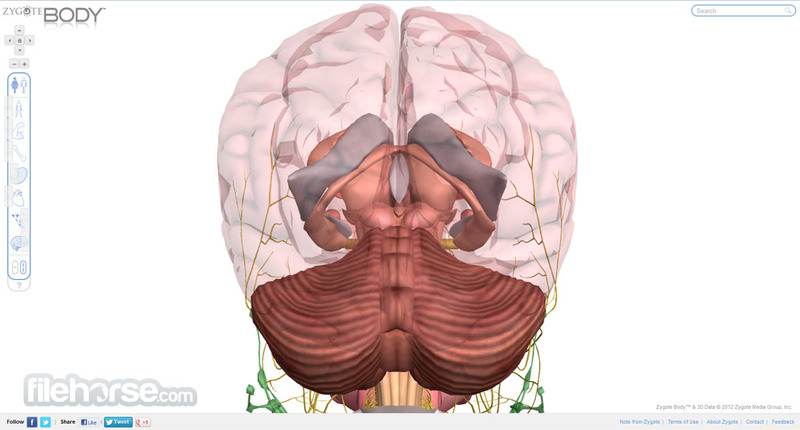 Very intuitive 3D human anatomy viewer! Internet giant Google has managed over the years to introduce many new projects that found their success not only commercially but also by promoting smaller ideas. One of those ideas became part of the Google Labs initiative, managing to bring simple anatomy 3D model tool to everyone. Originally launched under the name of Google Body in December of 2010, this great webapp continued to be accessible all up to late 2011 when its webpage was shut down as a part of the wind down of many Google Lab services. However just few months later this app was re-launched as Zygote Body, offering everyone who is interested in anatomy a simple and intuitive way of exploring intricacies of human body. Today, Zygote Body represents not only this great anatomy tool but also a open 3D viewer that can be used by anyone to showcase multi-layered 3D objects. Zygote Body is highly intuitive and usefulwebapp that enables anyone to easily manipulate 3D anatomical models of the human body. This all the most important layers of the human body, including muscles, bones, heart and cardio-vascular system, body organs, nervous system, and more. App allows users to easily switch between male and female body, with tools that enable simple switching between layers and identifying specific objects of the body. Entire user experience of Zygote Body was crafted to enable anyone easily access to its tools and interface, with no complicated procedures that can make you confused. After arriving on its webpage you will immediately be welcomed with the 3D viewer of the human male body that you can start manipulating and exploring its body parts and metabolic systems right away (during 2011 April’s Fool’s day, human model was switched with the full anatomical model of cow. This model can still be viewed here). Navigation tools are easily accessible, and they mostly represent those you can find today in Google Maps interface. Simple to use, but more than enough to help you to easily navigate to the body part you want to identify. Zygote Body had a long and interesting history (launch as a part of Google Body project, shut down, and re-launched in its current open source state), but even though it doesn’t offer as much as other professional solutions, it’s easy of use and simplicity can’t be ignored. Explore and discover human body now! Interface of Zygote Body is incredibly simple. You have access to only one page that showcases human body with great detail, and simple toolbar that houses navigational tools (virtual joystick) and buttons for different layers of human body – Skin, muscles, bones, digestive system, lymph system, and nerve system. All those layers can be turned on or off, or choose their specific transparency level. Body parts can be searched either manually or via text search bar. Found body parts can be marked so that they remain visible. Zygote Body is completely free for use. You don’t even have the ability to create new profile. 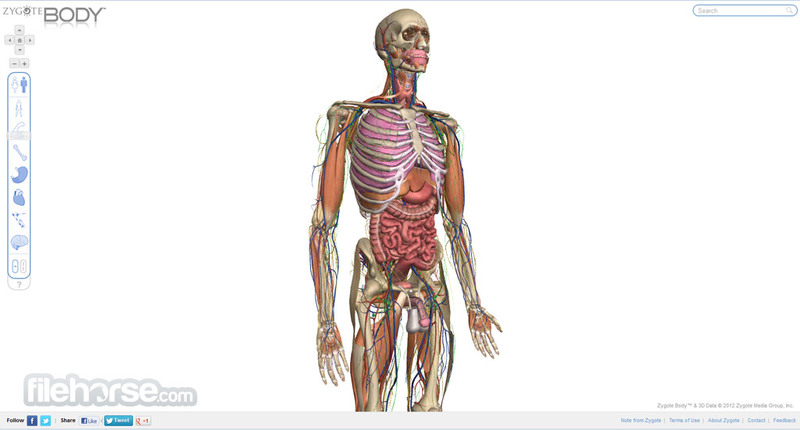 Zygote Body is a very simple 3D human anatomy viewer that can be used for quick and effortless discovery of body parts. It does not offer anything more than that (no detailed text info, no multimedia of any kind), but that doesn’t mean that it can be useful for people who just want simple discovery tool. Explore and discover human body now!